Can Companies Keep Up Strong Beat Rates in Q2 Earnings Season? 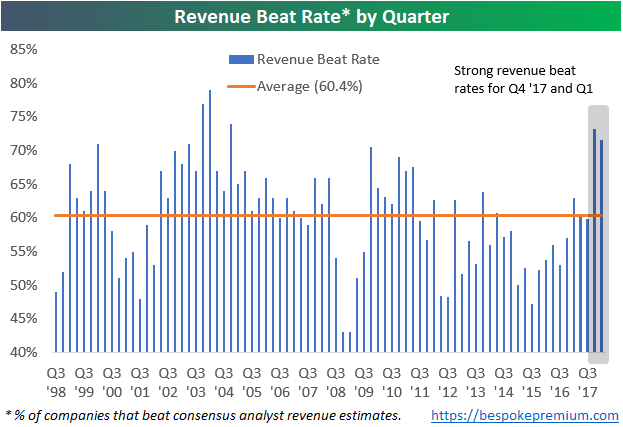 One thing we’ll be watching closely this earnings season is whether companies can keep up the extraordinarily high beat rates seen over the past two quarters. Over the past two earnings seasons, even though analysts had to up their estimates quite a bit due to the Trump corporate tax cuts, companies were easily able to beat expectations. Since 1999, 62.1% of earnings reports have reported EPS that were greater than consensus expectations. As shown below, though, the last two quarters saw much higher than average beat rates. Not only have bottom line EPS beat rates been strong, but top-line revenue beat rates have been strong as well. 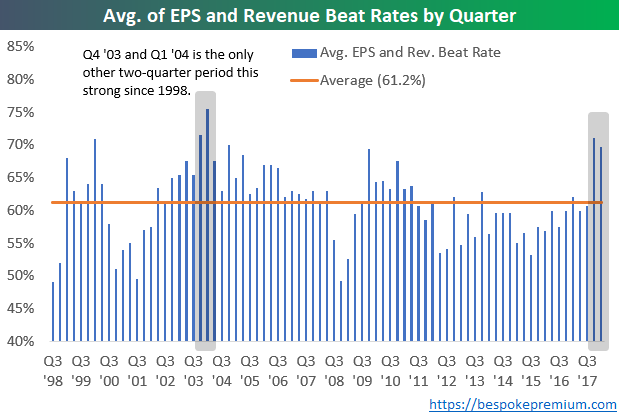 Revenue beat rates over the last two earnings seasons were higher than any quarter since Q4 2004. The chart below takes the average of each quarter’s earnings and revenue beat rate. 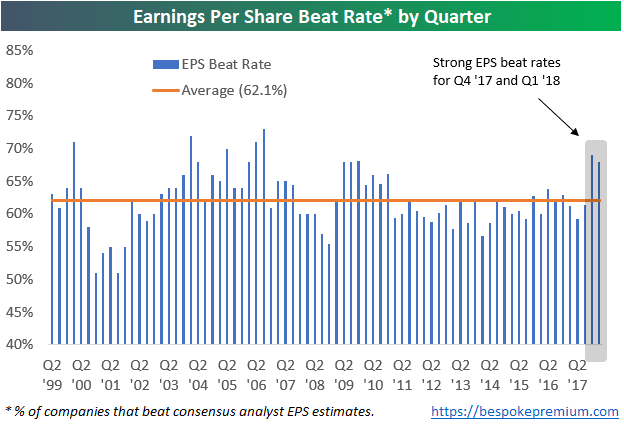 When looking at the strength of both the top and bottom line beat rate each earnings season, the only other two-quarter period that showed stronger beat rates than the last two quarters was back in Q4 2003 and Q1 2004. Needless to say, investors have gotten used to stronger than expected earnings reports over the last six months. If companies aren’t able to keep up the pace this season, we think the market will struggle.